imo is a good chat and messenger application for android and getting praises from users with the quality features they provide. You will able to find high quality video call and voice call features on the app. The best feature of the application is video call. Video calling is working properly and without lag on imo. Generally other apps have lagging problem with this feature but you won’t face with that problem on imo chat app. You will able to use sticker, group chat, text messaging features on this messenger app. It’s 100% free to download and use. 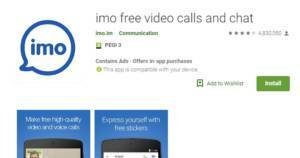 imo is one of the best messenger applications for Android mobiles. You can use the application freely. There are video call, voice call, text messaging and add contacts features on the application. You can talk to your friends from phone contacts with imo app. There are some technical errors about application sometimes but these errors are very rare. It doesn’t have any feature for make friends or meeting new people. It slow downs to phone. Problems with video call sometimes. Sometimes there is problem with online users list. It’s reported that sometimes online people may appear offline or online people may appear offline on this app.